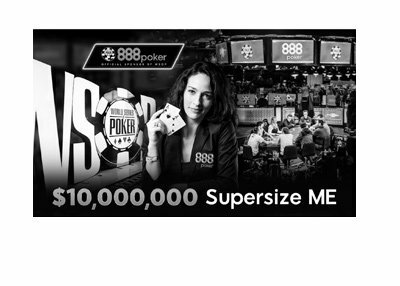 888poker, which is the official sponsor of this year's World Series of Poker, recently launched their "Supersize ME" promotion. The gist behind this promotion is simple - if you qualify for your World Series of Poker main event seat through 888poker and end up taking down the event, 888poker will guarantee you a payday of $10 million USD. So, if you qualify through 888poker and take home $8 million USD after taking down the main event, 888poker would top you up with an extra $2 million USD to make it an even payday of $10 million. Since the start of the World Series of Poker, only two men - Jamie Gold ($12,000,000) and Martin Jacobson ($10,000,000) - have won at least $10 million in the main event. The most recent winner, Qui Nguyen, took home a little over $8 million for his win in 2016, while Joe McKeehen won $7,683,346 in 2015. With the World Series of Poker main event starting in less than three months, the time to qualify for your seat is running out.